One particular cluster, called NGC 3201 and situated in the southern constellation of Vela (The Sails), has now been studied using the MUSE instrument on ESO’s Very Large Telescope in Chile. An international team of astronomers has found that one of the stars in NGC 3201 is behaving very oddly — it is being flung backwards and forwards at speeds of several hundred thousand kilometers per hour, with the pattern repeating every 167 days. ESO’s MUSE instrument provides astronomers with a unique ability to measure the motions of thousands of far away stars at the same time. With this new finding, the team have for the first time been able to detect an inactive black hole at the heart of a globular cluster — one that is not currently swallowing matter and is not surrounded by a glowing disc of gas. 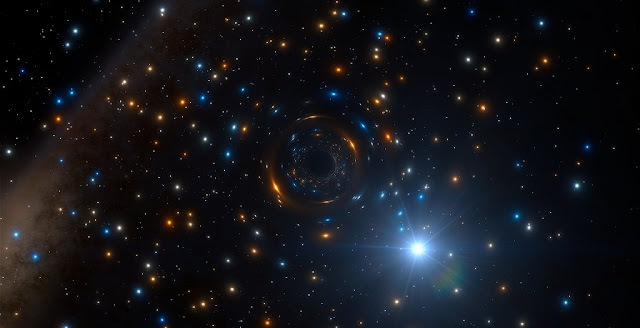 They could estimate the black hole’s mass through the movements of a star caught up in its enormous gravitational pull.